RMVB (RealMedia Variable Bitrate) format was popular in the direct download world, especially for distributing Chinese movies, TV episodes and Japanese Anime some years ago. But the biggest problem with RMVB files is that they can't play on iPhone iPad Android mobile devices and many other media players. Converting RMVB to MP4 widely accepted by devices and media players is a straightforward solution to RMVB incompatibility issue. This tutorial demonstrates how to convert RMVB/RM into MP4 for iPhone, iPad, iPod, PSP, Android mobile devices, TV, QuickTime, iTunes etc. using the top-rated RMVB to MP4 converter, without destroying quality in a fast speed. 1. Convert RMVB to MP4 with 350+ preset profiles for iPhone, iPad, iPod, Android PSP Samsung Galaxy, Xbox, Apple TV, smart TV etc. 2. Convert RMVB into MP4 in at least 5x faster speed than other free RMVB to MP4 converters, thanks to HT tech, QSV acceleration tech, Multi-core CPU (up to 8 cores) processing, and give original quality with the help of High Quality Engine. 3. Convert RealMedia file RM RMVB to MP4, AVI, MKV, WMV, MOV, WebM and various other formats. 4. Direct download RMVB TV shows, movies, Japanese Anime from 300+ sites to MP4 format. 100 Clean, no ads, no spam, no malware. 5. The best video converter for Mac/Win is also compatible with the latest Windows 10 and macOS Sierra. How to Fast Convert RMVB to MP4 without Quality Loss for Android iPhone iPad TV QT etc. Step 1: Click "Add Video" icon at the top left corner on the main interface, and select RMVB files to convert. You can drag and drop the files. Step 2: From the popping up Output Profile window, click General Video profile and select MP4 Video. Click "Done" to apply the output profile. And hit "Browse" to select a default destination folder to save converted MP4 file from RMVB. Step 3: Click "RUN" to start converting RMVB to MP4 quickly without losing quality for iPhone, iPad, Android, TV, iTunes, or QuickTime etc. The RMVB to MP4 converter can convert HD videos and SD videos with built-in 370+ video and audio codecs, for example, it can convert MKV to MP4, AVI to MP4, H.265 to H.264, HEVC to MP4, VOB to MP4, FLV to MOV, M2TS to AVI etc. What is RMVB - RMVB stands for RealMedia Variable Bitrate, is a container file developed by RealNetworks and playable on RealPlayer. Compared with the previous generation RM, RMVB delivers better image quality as it reduces bit rate. RMVB was popular for live streaming Chinese TV shows, movies and Japanese Anime on Anime sites a few years ago. But RMVB is not supported by mobile devices, it is gradually replaced by MP4, AVI, MKV etc. container format. RMVB vs MP4 - RMVB has obvious disadvantages compared with MP4, AVI, MKV etc. popular container formats. RMVB vs MP4, MP4 is definitely much better than RMVB format in compatibility, compression ratio, quality and file size. By converting RMVB to MP4, you can play MP4 file on nearly any player or mobile device, with the same quality and file size. RMVB was mainly designed to stream content when users have bad bandwidth. RMVB is a dead format while MP4 is a rising format. To play RMVB on iPhone, iPad, iPod, Android PSP Xbox, TV etc. 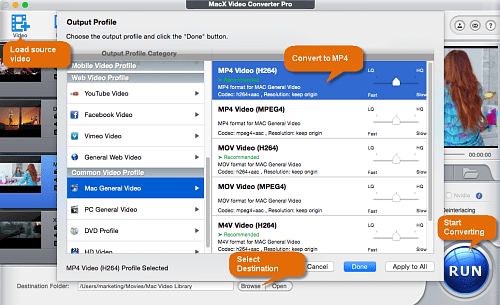 convert RMVB to MP4 or other compatible format using free video converter. To play RMVB on Mac/Win, use RMVB player RealPlayer, open source media player VLC. Note that many standalone players cannot play RMVB file. Free download the fastest RMVB to MP4 video converter - MacX Video Converter Pro to quickly convert RMVB to MP4 on macOS and Windows with nearly original quality kept in 5x faster speed than other free RMVB to MP4 converters, and play/edit/upload RMVB files easily.